1 Bedroom, 1.5 Bath Cabin with Privacy but Close to Parkway! **If you're ready to book now, please click the 'Request to Book' button. If you have questions or would like a quote, please click 'Send Message'. SMOKY LOVE is a one bedroom cabin nestled on the side of Bluff Mountain, about 5 miles from downtown Pigeon Forge, approximately 8 miles from Dollywood and about 14 miles from Gatlinburg. It has easy access and a porch that surrounds you in natural beauty. So peaceful with privacy and gentle breezes whispering through the trees. Enjoy the Hot tub on your private porch or cuddle up by the wood burning fireplace. SMOKY LOVE is a true log cabin with all the comforts of home. . . with fully equipped kitchen, flat screen tvs, and a king bedroom in the loft with all the seclusion you will need to celebrate your romantic getaway. Brand new sofa sleeper put in June 18, 2015. **If this cabin is booked for your desired dates, check out VRBO #367295 or #368064, and #369981, they are my other 1 Bedrooms just like Smoky Love in the same area. **WE DO NOT REFUND BECAUSE YOU CANNOT GET TO THE CABIN DUE TO WEATHER OR ANY OTHER REASON. THEREFORE, WE HIGHLY RECOMMEND PURCHASING TRIP INSURANCE. **WE DON'T ALLOW PETS OR SMOKING. My husband and I live here in East Tennessee and love to go to the Smoky Mountains. SMOKY LOVE is a great honeymoon or anniversary cabin, or even works for 3 or 4 with the pull out sofa sleeper. 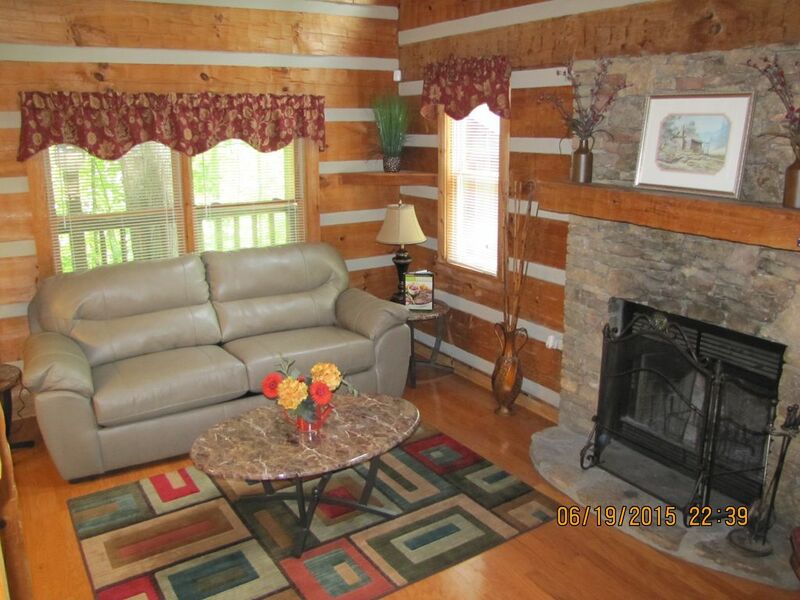 It's in the mountains with privacy in the woods but close to everything in Pigeon Forge! toilet, Private half bath in master bedroom. Dishes, silverware, cookware, utensils, coffee maker, blender, toaster. We will be back again. Didn't want to leave. Perfect stay for a romantic getaway. Close enough to town, but a feeling of seclusion at the cabin. We will be back for sure. My boyfriend and I loved this cabin! It was the perfect size space for us. We enjoyed the hot tub, the fireplace and having wifi and television. It was clean and had everything we needed. Loved how simple checking in and out were!! We would not hesitate to stay here again. We will go again. Great location, everything was clean and neat,not the most modern yet ya can’t beat the price. Cons... I think the hot tub must have been shocked with chlorine that moring so strong!